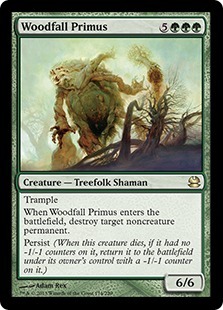 Browse > Home / Strategy / Articles / Ultimate Masters Spoiler Card: Woodfall Primus! 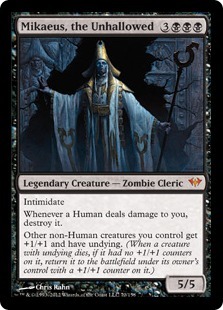 After six years of posting Commander content, I am proud to declare that Wizards of the Coast has finally, FINALLY, given me a sweet Commander card to spoil for them! I've finally made it big, ladies and gentlemen! Huzzah! Woodfall Primus reprint! This is great news for us Commander players, since it's a popular card that has crept back up to $9 USD at the time of writing this article despite getting reprinted once already in Modern Masters. Hopefully this new reprint in Ultimate Masters will keep its price down for a few more years. So you crack an Ultimate Masters pack and discover Woodfall Primus as your rare. 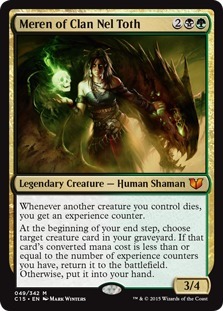 Your first reaction is probably crushing despair at not opening a chase mythic like Liliana of the Veil, Karn Liberated, or Tarmogoyf, along with quiet contemplation about the life choices that led you to this moment. But after you get over your initial disappointment, you'll think about what you'll do with this card: trade it away, or keep it and play with it? I'm here to tell you that if you play Commander or have any interest in trying the format, then you should totally rock the Primus in a deck! Thankfully, Woodfall Primus is actually a great card in Commander and there's a big variety of decks that would like to run it, so convincing you to give it a shot will be a breeze - unlike, say, trying to convince people that Oath of Druids is a sweet Commander card, which would be a nightmare. So let's analyze Woodfall Primus and see what makes the ol' Treefolk tick, and what decks can use it best! 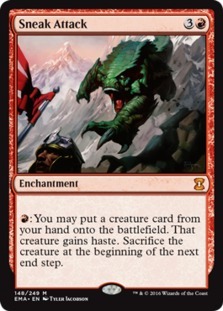 Unlike most Magic formats, where the vast majority of threats come in the form of creatures and all your maindeck removal is going to be creature removal, Commander has more diverse threats that need diverse answers: you still need answers to nasty creatures like Sheoldred, Whispering One, but you'll also need a way to get rid of enchantments like Zendikar Resurgent, artifacts like Sword of Feast and Famine, and even pesky lands like Maze of Ith or Vince's Golgari Rot Farm. It's essential for your Commander to have good, flexible answers to whatever your opponents throw at you. 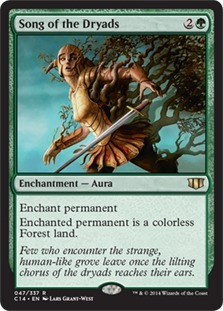 When I think about the most flexible removal options in Green, four immediately come to mind: Beast Within and Song of the Dryads at the low end of the mana curve, and Woodfall Primus and Terastodon at the high end. 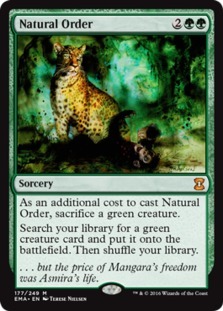 Both Beast Within and Song of the Dryads can deal with any permanent unconditionally - including creatures, which Green almost never can do unconditionally - for just 3 mana. 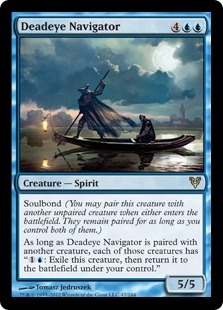 Beast Within has the advantage of instant speed and cannot be undone with a Disenchant effect, but Song of the Dryads has the advantage of being one of the most brutal answers for a commander, because unlike most forms of removal, Song doesn't allow the commander to return to the command zone to be recast. 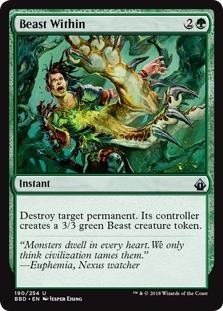 These two are simply the best cheap unconditional removal in Green. Meanwhile on the high end of the mana curve we've got Woodfall Primus and Terastodon. Despite not being able to remove creatures, both see a lot of play in Commander due to the other advantages they bring to the table. They're both 8 cmc, both blow up multiple noncreature permanents, and both are large creatures that can do serious damage in the red zone. If I had to choose my favorite of the two in a vacuum then I'd pick Terastodon since it blows up three permanents immediately and has a larger body. The raw power floor is simply higher with the Elephant. 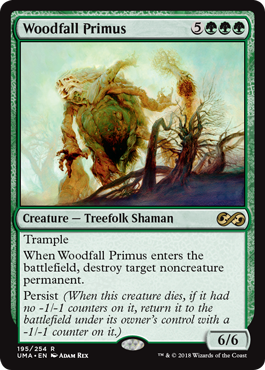 However, Woodfall Primus undoubtedly has the higher power ceiling if you build around all aspects of the card, which makes the Treefolk the better card in my opinion. With just a surface-level analysis, Woodfall Primus is a solid top-end inclusion in just about any Green deck, offering flexible removal on a respectable body that has built-in protection against removal. 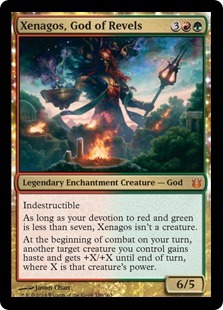 If we go a wee bit deeper then I'll add that having trample makes the Primus an excellent candidate for pumping power, which is why I personally love it in my Xenagos, God of Revels deck; blowing up threats and then swinging with a 12/12 trample creature is pretty good! It's totally fine to pay 8 mana to hard cast Woodfall Primus. In some decks that can consistently generate crazy amount of mana, like Omnath, Locus of Mana, this is the correct way to play the card. But nothing's sweeter than slamming down a Primus for a fraction of its mana cost instead! Green has a few ways to cheat Primus into play: Natural Order and Defense of the Heart are two of the strongest options, acting as both tutors and cheats for just 4 mana. 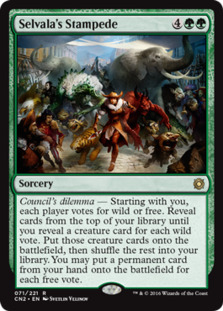 We can also put Primus into play from our hand for cheap with Garruk, Caller of Beasts and Elvish Piper, or from the top of our library with Lurking Predators and See the Unwritten, or do both with Selvala's Stampede. Manipulating the top of our library with cards like Sylvan Library and Sensei's Divining Top make these cards even better. We have even more options outside of Green. When we add Red we have access to the almighty Sneak Attack and all its variants, which work especially well with Woodfall Primus: we sneak it in for just 1 mana, blowing something up and swinging for 6 damage, and then sacrifice it so it stays in play and blows up something else! Absolutely bonkers! 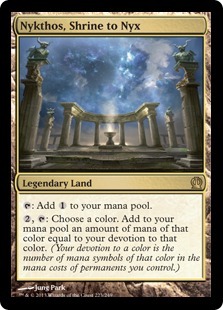 This is amazing in Xenagos, God of Revels, which loves both cards individually and then goes straight to value town when you combine them all together. 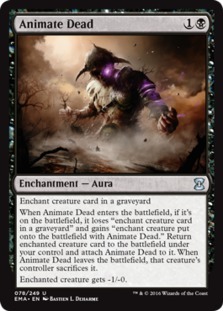 Of course, nobody cheats creatures into play better than Black, the color of ultimate graveyard shenanigans: we can easily cheat Woodfall Primus from our graveyard to play with cheap staples like Necromancy, Animate Dead, and Reanimate. Any Golgari Graveyard deck, like Meren of Clan Nel Toth, should seriously consider Woodfall Primus as a top-end creature to reanimate. The majority of Woodfall Primus' power lies in its enter the battlefield (ETB) trigger. While its generally going to trigger twice on its own, we have many options available to really abuse this trigger. The best archetypes to take advantage of its trigger is Blink and Sacrifice. The Blink archetype (named after Momentary Blink) is all about re-using ETB triggers by temporarily exiling the permanent and then returning it to play so the ETB trigger happens again. Pairing Woodfall Primus with cards like Conjurer's Closet and Deadeye Navigator lets us machine-gun down our opponent's permanents while also removing any -1/-1 counters on the creature so we get more out of its persist mechanic. We can also double up on ETB triggers with the help of Strionic Resonator and Panharmonicon. 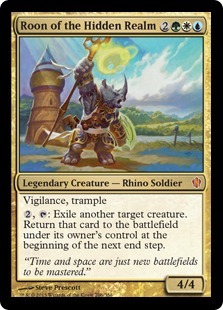 The most notable Green Blink deck is led by Roon of the Hidden Realm, which the Primus is an amazing addition to. Alright, let's take off the kid gloves and talk about the absolute most busted things we can do with ol' Woodfall Primus: the Sacrifice archetype and infinite combos! 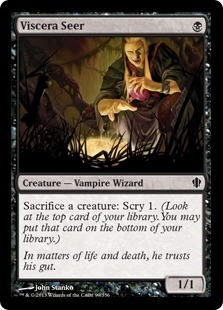 Sacrifice decks are almost always Black and have a Graveyard subtheme, which means we're always running plenty of ways to cheat the Primus into play with cards like Animate Dead, so we're off to a good start. With a consistent source of sacrifice outlets like Viscera Seer and Ashnod's Altar, we have control of when we want Woodfall Primus to die and come back to blow up something else with its trigger. These are fine benefits to running the Primus in a Sacrifice deck, but that's just minor stuff compared to our true intention: we're looking to combo off, blowing up ALL of our opponents' noncreature permanents and essentially locking them all out of the game. There's a bunch of different ways to set up a Woodfall Primus infinite combo, but they all boil down to these components: a free sacrifice outlet and a way to remove -1/-1 counters. That way we can sacrifice Woodfall Primus an infinite number of times and it keeps coming back to blow up more stuff. One easy variation is any free sac outlet like Viscera Seer + Mikaeus, the Unhallowed + Woodfall Primus. We sacrifice Primus to Seer, then either return it to the battlefield with a -1/-1 counter due to its persist mechanic or with a +1/+1 counter due to Mikaeus' undying mechanic. Then we sacrifice Primus to Seer again and return it to the battlefield with the mechanic we didn't choose the last time. We keep sacrificing and returning Primus this way, machine-gunning down all our opponents' noncreature permanents and destroying their enjoyment of the format. Another variation is Ashnod's Altar + Nim Deathmantle + Woodfall Primus. We sacrifice Primus to the Altar twice to generate 4 mana and use that mana to pay Deathmantle's trigger and return Primus to play to repeat again. While these combos don't outright win you the game, your opponents are basically dead if this resolves. If you want to make the combo itself lethal you can add a fourth card like Blood Artist to drain out the opponents. Any BG(X) Sacrifice deck can pull off these combos with ease. Mazirek, Kraul Death Priest, Meren of Clan Nel Toth, Jarad, Golgari Lich Lord all should consider running Woodfall Primus to pull off these sort of shenanigans. Oh! Treefolk Tribal! It's a pretty decent tribe and Woodfall Primus is undoubtedly one of the best in the tribe. 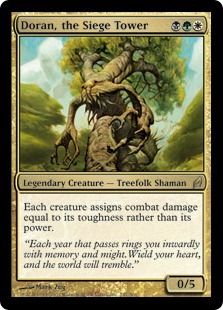 Try running it in Doran, the Siege Tower Treefolk Tribal for funsies. Primus is also a Shaman, which doesn't have enough tribal support to really be a deck but may in the future! Woodfall Primus' GGG casting cost makes it nice for Green Devotion decks! Big ramp with Nykthos, Shrine to Nyx and Karametra's Acolyte, turn on Nylea, God of the Hunt and start swinging? Pretty deece. 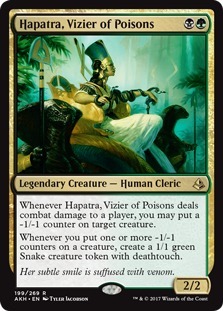 The -1/-1 counter from its persist mechanic generates a snake with Hapatra, Vizier of Poisons, which is neat? I hope you enjoyed my analysis of Woodfall Primus. It's an old favorite of mine that still remains powerful in the format today. I loved writing about my first spoiler ever and I hope I'll be able to do so again with Ravnica Allegiance!